B.K.S. Iyengar wanted to easily convey the philosophy of Patanjali’s Yoga Sutras. He used the symbology of a tree to explain the eight stages of yoga. All eight stages should be practiced and perfected in order to perceive the true Self which is the ultimate goal of Yoga. For Guruji, the tree of Yoga is composed of Root, Trunk, Branches, Leaves, Sap, Bark, Flowers and Fruits. They are all integrated. None can be developed separately, and you need to know the parts to understand the whole. 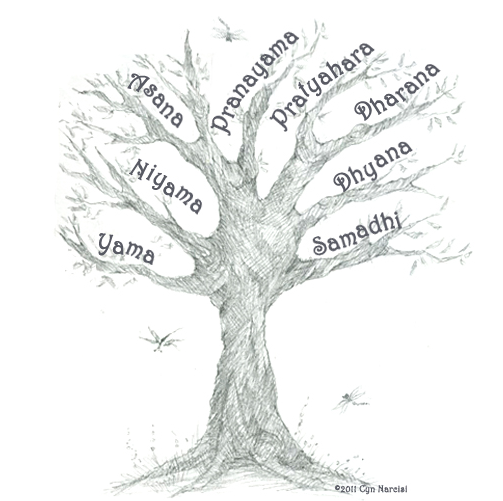 Yama is the root of the tree. It comprehends the universal social moral rules that transcend all beliefs, countries, ages and times. Satva, or love for the truth. Brahmacharya, or control of sensual pleasure. Aparigraha, or be free of greed and possession beyond your own needs. Santosa, or contentment or satisfaction. Svadhaya, or study of the Self. These principles of Niyama control the organs of perception: Eyes, ears, nose, tongue, and skin. Yama and Niyama control the passions and emotions, keeping the practitioner in harmony with the people around. 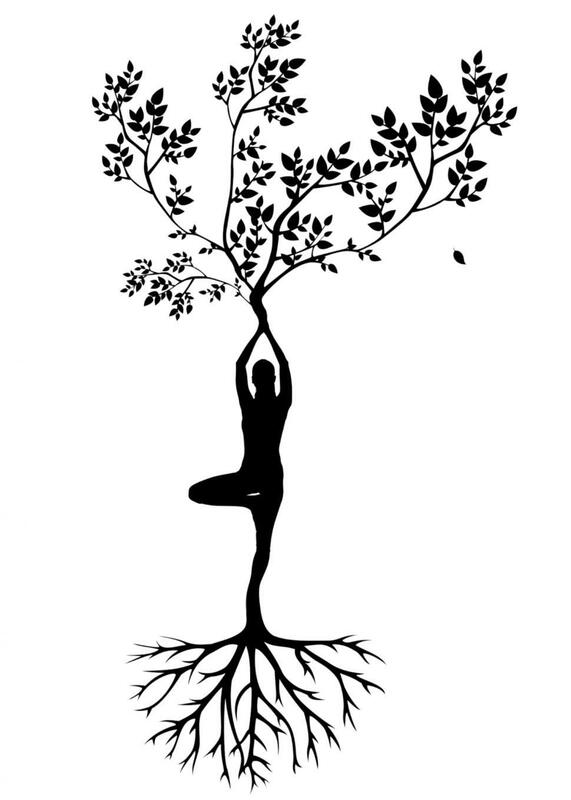 Asanas represent the tree branches which grow in different directions and may twist and zigzag. Nonetheless, they all have the same purpose: to provide health and balance between body, mind, and spirit. Asanas harmonize the physical and physiological functions of the body and prevent the mind from running rogue. The practitioner conquers the body through the practice of asanas, making the body an appropriate vehicle for the spirit. These first stages constitute the Bahiranga Sadhana or outer pursuit in the path of yoga. Yoga practitioners need to evolve up to this point so they are able to successfully continue to the following stages: Pranayama and Pratyahara. From the branches, the leaves are born. These leaves supply the air necessary to create the energy required by the tree. In yoga, the leaves that connect the exterior with the insides correspond to Pranayama, the science of breathing. Through the control and regulation of breathing, the yogi develops a stable mind, strong willpower, and firm judgment. Pranayama makes the mind a suitable instrument for meditation. The tree branches and trunk are covered by bark. Without this protection, the tree could not develop. This cover keeps the energy flowing from the leaves to the root. The bark corresponds to Pratyahara, the inward journey of the senses. It is the withdrawal of the mind from the domain of the external senses. Pranayama and Pratyahara teach the practitioner to regulate the breath to be able to control the mind. Controlling our mind helps us to release the senses of desire. These two stages of yoga comprehend the inner quest, also called Antaranga Sadhana. The sap of the tree corresponds to Dharana. The sap is the juice that carries the energy in its journey towards the interior. Sap helps to connect the leaves to the root, holding our bodies and intellect strong. Dharana is also explained as “single-point focus.” The experience where the observer and the observed become one. When we keep the concentration for a long time, it becomes Dhyana. Meditation. Dhyana is the flower of the yoga tree. When the tree is healthy and the energy supply is excellent, flowers sprout from it. Finally, the flower becomes fruit, and the fruit is Samadhi. Just as the essence of the tree is complete in the fruit, the essence of the practice of yoga is in Samadhi. In this stage, body, mind, and soul unite and merge with the Universal Spirit. These last three stages, Dharana, Dhyana, and Samadhi, carry the yogi to the depths of the soul. This is called Antaratma Sadhana, the quest for the soul. The study and practice of the eight limbs of yoga lead to the purification of body, mind, and intellect, keeping the flame of knowledge and peace alive.